Namche Bazaar, also known as the gateway of Everest Base Camp Trekking, which stood intact in the recent earthquake, is now awaiting tourists. Thousands of domestic and foreign tourists en route to the world's highest mountain visit Namche Bazaar of Solukhumbu district every year to enjoy the scenic beauty of the place. However, rumors about devastation by quake have adversely affected tourism in the area. Local people said, "Nothing except a few residential houses has been damaged here." Fear among tourists is natural, especially after the strong aftershocks that followed the devastating April 25 earthquake. But Namche Bazaar, which stood intact in the quake, is without tourists these days. "Namche is still safe for tourists to visit”. 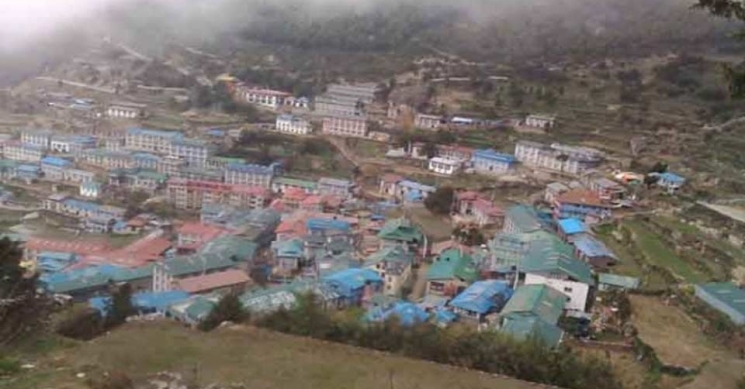 Both the earthquakes of April 25 and May 12 have inflicted minor damage to Namche Bazaar area. Only around 250 private houses in the rural areas of Namche have been destroyed, while 150 residential houses have been damaged. The news about complete destruction of Namche Bazaar is not true, according Angphinjo Sherpa, a civil society leader. "All the tourism entrepreneurs waiting to welcome tourists," he said. Namche is one of the most attractive tourist destinations in the world. It has 53 hotels and lodges. However, only two people lost their lives at the Everest Base Camp due to an avalanche triggered by the earthquake. Bikram Thapa, a local radio journalist, of district headquarters, Salleri, has recently reached Namche Bazaar for reporting after four hours of trekking. "I found Namche stood unaffected," he told Republica. "I found half of a dozen hotels and lodges have developed cracks due to the earthquake." However, most of those tourists who were in the Namche area at the time of the earthquake have already flown back to their countries.